If you happen to fly into Orlando, Busch Gardens is definitely worth a visit. First, you get to see the rest of Florida and get out of Orlando and second, it has unique wildlife and rocking coasters. 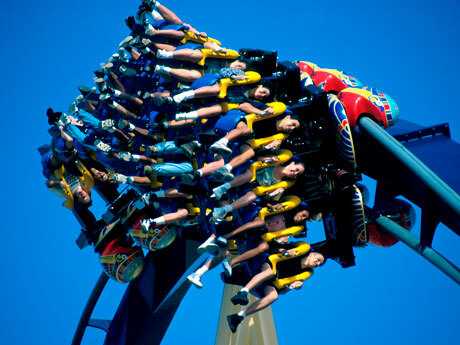 Busch Gardens Tampa Bay is the ultimate family adventure park offering an array of fascinating attractions based on exotic encounters with the African continent. A unique blend of thrilling rides, one of the country’s premier zoos featuring more than 2,000 animals, live shows, restaurants, shops and games, Busch Gardens Tampa Bay provides unrivaled excitement for guests of every age. Some rocking coasters like Montu that has a 60-foot vertical loop, an Immelman loop and a zero-G roll. Also did we mention seven intense inversions! – Corner of Busch Boulevard and 40th Street- Two miles east of Interstate 275 at the Busch Boulevard exit or Two miles west of Interstate 75 at exit 54-One hour from Orlando via Interstate 4 West-Thirty minutes east of area beaches and Tampa International Airport. Hours are extended during select weekend, summer and holiday periods. This entry was posted in Coasters, Theme Parks and tagged Busch Gardens Tampa Bay, Montu. Bookmark the permalink.